LED matrix displays provide flexibility to display text, graphics, animations, and video, and therefore, they have become a popular mean of displaying information these days. You can see them at gas stations displaying the gas prices, or in the public places displaying information, and alongside highways displaying advertisements on large dot matrix panels. This project is about constructing a mono-color LED matrix display board that consists 320 LEDs arranged in 8 rows and 40 columns. 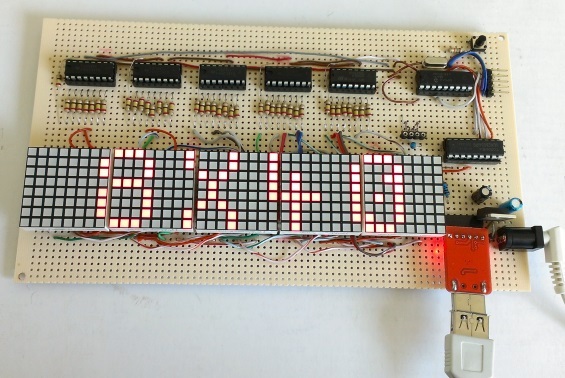 The heart of this project is PIC16F1847 microcontroller which receives data from a PC through a serial port (or USB using an USB-UART interface), and display on the LED matrix with the help of five 74HC595 shift registers. 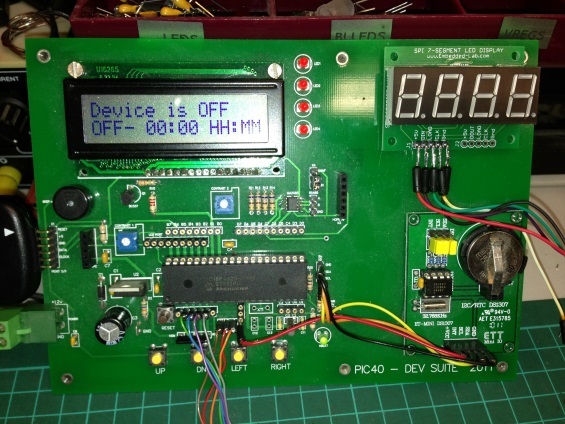 Mark Weir from Australia sent us his revision of our Programmable digital timer switch project. 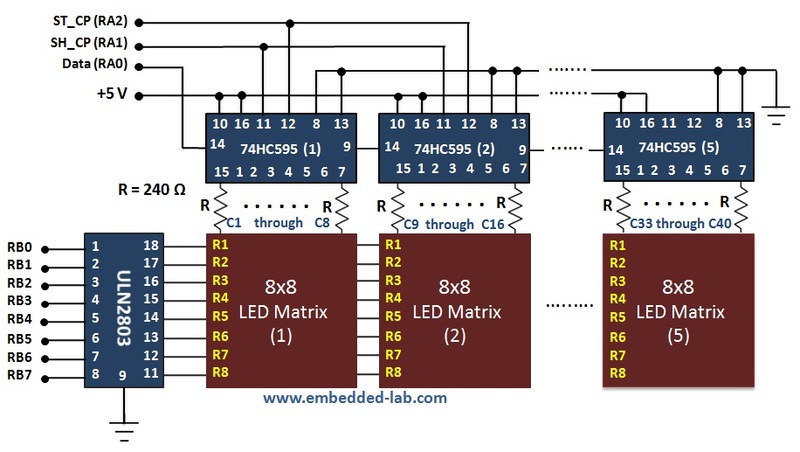 He modified the original code, which was written for PIC16F628A, to incorporate it with PIC18F4620 microcontroller, while hardware and overall functionality remain the same. Here is a link to download his modified version of the firmware written in MikroC compiler. Data retention with internal EEPROM memory. Measurement and control of temperature and relative humidity finds applications in numerous areas. These days devices are available which have both temperature and humidity sensors with signal conditioning, ADC, calibration and communication interface all built inside them. The use of such smart sensors greatly simplify the design and reduces the overall cost. We discussed in past about Humidity and temperature measurements with Sensirion’s SHT1x/SHT7x sensors. These sensors are capable of measuring both temperature and relative humidity and provide fully calibrated digital outputs. While SHT1x/SHT7x are very accurate sensors, they are still expensive for hobbyists use. 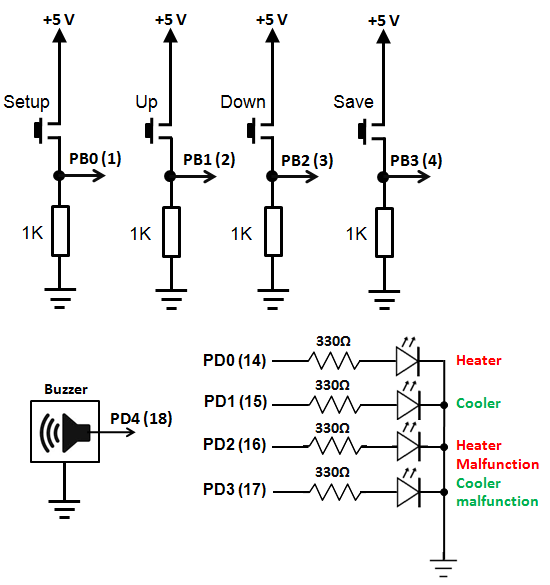 This articles discusses the DHT11 sensor which also provides calibrated digital outputs for temperature and humidity but is relatively lot cheaper than the Sensirion sensors. 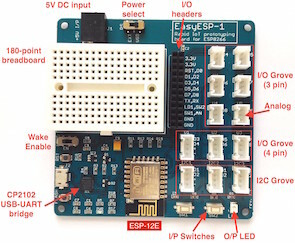 The DHT11 sensor uses a proprietary 1-wire protocol which we will be exploring here and implementing with the PIC16F628A microcontroller that will receive the temperature and humidity values from the sensor and display them on a 16×2 character LCD. 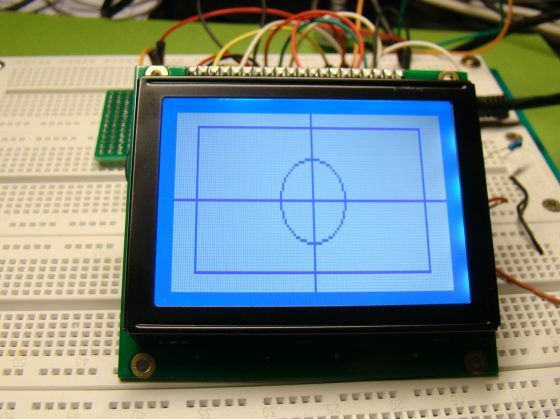 The use of a graphical LCD (GLCD) drastically changes the look of your project. 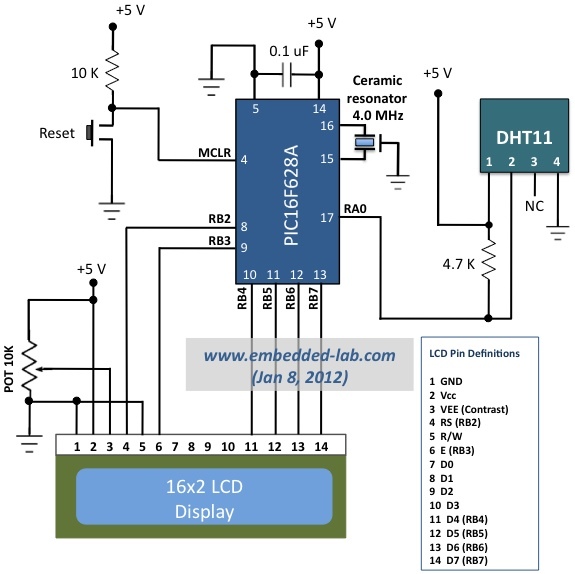 It provides more freedom for presenting data than the HD44870 based character LCDs. 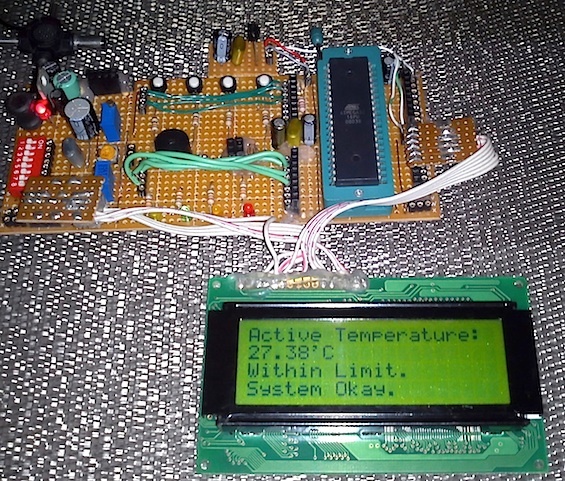 Today we will see how to interface a KS0108 (name of the display controller chip) based GLCD to a PIC microcontroller. This experimental tutorial is divided into two parts. 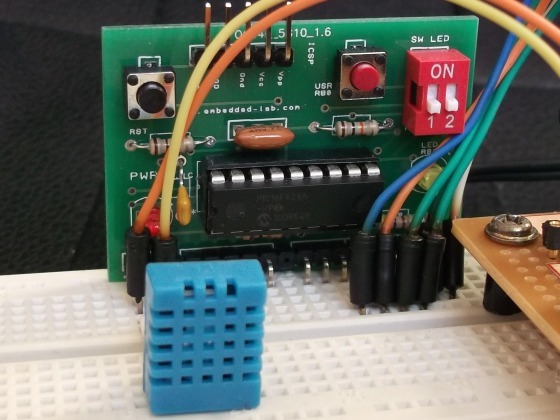 In the first part, we will see how to write a firmware for the PIC microcontroller to initialize the GLCD and send data to plot points and lines on the screen. The second part will focus more on exploring the built-in GLCD Library of mikroC Pro for PIC compiler to display more complex texts and objects. Since GLCDs are real resource hungry devices (in terms of required I/O pins and memory), a bigger size PIC microcontroller (PIC16F887, which has 36 I/O pins and 14KB flash memory) is selected for this experiment. 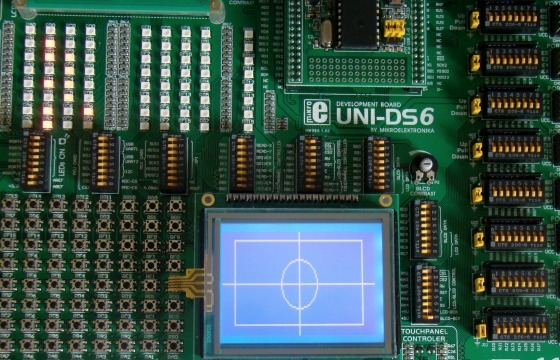 I am using MikroElektronika’s UNI-DS6 development board to demonstrate this project, but the circuit setup can also be made on a breadboard.